Crime fiction adores girls in trouble. Moretti’s latest nail-biter (The Vanishing Year, 2016, etc.) is no exception, but it is exceptional. Alecia and Nate Winters are the golden couple of Mt. Oanoke, Pennsylvania. Nate teaches math and coaches baseball at the local high school, and Alecia takes care of their 5-year-old autistic son, Gabe. But underneath the surface, all that glitters isn’t gold. Alecia endures the daily emotional and physical bumps that come with taking care of a special needs child while Nate basks in the adoration of a town that loves him. 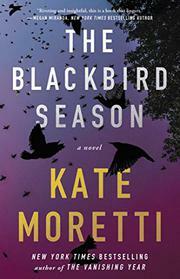 It seems as if a thousand blackbirds falling to their deaths on the baseball field might have been a bad omen, because soon after that strange event, Nate is accused of having an affair with 18-year-old senior Lucia Hamm, of the wild, white hair and the red, red lips, and the fractures in his marriage begin to show. He insists the girl is in trouble and he was trying to help, but Alecia isn’t so sure, and the town quickly, shockingly, turns against him, immediately assuming the worst. When Lucia goes missing, all hell breaks loose. The narrative is told from the viewpoints of Nate, Alecia, Lucia, and Bridget Peterson, a fellow teacher who's a friend of the Winters' and who is one of the few who believes Nate is innocent and finds evidence that Lucia could have been the victim of an assault. Moretti explores the fierce cruelty of teenagers (they frequently call Lucia a witch) as well as the complex bonds of friendship and marriage, and she sets it all against the desperation of a dying small town. Though Moretti’s emotionally astute tale can be heart-rending, readers won’t be able to look away. As slow, creeping dread sets in, so does the inevitability of the terrible situation the town finds itself in, offering a deliciously sinister glimpse into the duplicity of small-town lives and the ease with which people turn on each other when tragedy comes calling. Moretti’s tale of jealousy and obsession is nothing less than dark magic. Witchery indeed.